A Swedish-led Protestant army marched to the rescue of Nordlinger. But first it would have to pry the Catholic enemy from heights above the city. From within the walled city of Nördlingen in the Upper Palatinate, a lone rocket arced slowly skyward on the night of September 3, 1634. Its glittering tail streaked across the night sky before bursting into flame. The initial blast was followed by several more in quick succession. The signal rockets were a desperate cry for help by the small garrison trapped inside the Free Imperial City to a substantial Protestant relief force camped six miles west at the village of Bopfingen. The stranglehold that a strong Catholic force of 18,000 Bavarian and Imperial soldiers had on the city was growing tighter with every passing day. Since their arrival on August 17, the Catholics had camped on a crescent-shaped string of hills surrounding the town, pinning the inhabitants inside the city. The Catholics’ siege works lay within 500 yards of the town’s main walls. Earlier that day, they had unleashed a ferocious bombardment on the town, whose walls were too weak and whose garrison was too small to save it from destruction. The inhabitants of Nördlingen were panic-stricken—with good reason. Three years before, 24,000 Protestants had been slaughtered when ruthless Catholic mercenaries pillaged and burned Magdeburg on the Elbe River. The people of Nördlingen could expect a similar fate. By 1634, the Thirty Years’ War had dragged on for 16 years. It began as a test of wills when Ferdinand, king of Bohemia and soon-to-be-elected Holy Roman emperor, sought to impose strict Catholic doctrine on staunchly Protestant parts of Bohemia. Following the Defenestration of Prague on May 23, 1618, during which an angry mob flung two of Ferdinand’s deputies out of a palace window in Prague, the Bohemian estates voted out Ferdinand and installed Frederick V of Palatinate as their new king. Catholic forces, including Imperial forces fielded by Ferdinand and the Catholic League armies financed by Elector Maximilian of Bavaria, eventually gained the upper hand over the Protestants, until King Gustavus Adolphus of Sweden interceded on the Protestants’ behalf. After landing with his troops in June 1630 on the shores of Pomerania, the gifted and brilliant Swedish commander personally led his forces to stunning victories over Catholic armies at Breitenfeld and Lützen. The latter victory came at great cost, however, when the Swedish king was fatally shot from his horse while leading a counterattack. After Gustavus’s death, Sweden forged a new alliance with the Protestant princes of southwest Germany through the establishment of the League of Heilbronn. The league gave the Swedes a forward base in southwest Germany from which to continue offensive operations against the Catholic League’s Imperial armies. The Protestants’ new leader was German noble Bernhard Saxe-Weimar, an aggressive but arrogant commander who had fought admirably under Gustavus. Protestant operations in the south German corridor would be split between Bernhard and Gustav Horn, marshal of Sweden, a solid tactician but a more cautious general than his German ally. Bernhard and Horn inherited a troubled Protestant army comprising Swedish professionals and German mercenaries. For all his genius, Gustavus had neglected the welfare of his men, many of whom had not been paid properly for their service in the army. In 1633 there was open mutiny in the ranks, and Bernhard took advantage of the situation to press the Swedish chancellor for a hereditary title. To placate Bernhard and bring the mutiny to an end, the league provided back pay to the troops, granted estates to some of the officers, and named Bernhard the duke of Franconia. By August 1633, the now-appeased army prepared to resume offensive operations against Catholic forces. Bernhard and Horn led independent commands. Horn’s Swedish forces operated in Baden, while Bernhard threatened Bavaria from the Danube River. On November 13, Bernhard captured the Free Imperial City of Regensburg. Meanwhile, a third Protestant army under Swedish Field Marshal Johan Baner was in Silesia regrouping for an attack on Bohemia. Horn and Bernhard planned to reunite for an offensive that would secure southeastern Germany for the Protestants and carry the war into Bavaria. Facing attack from two different directions, the Catholic forces, commanded by 26-year-old Archduke Ferdinand, the king of Hungary, confronted a tough choice. Rather than defend Prague against Baner, Ferdinand chose instead to march west in the hope of clearing the Danube corridor and linking up with his cousin, Prince Fernando Hapsburg, the archbishop of Toldeo. The Cardinal-Infante, as he was known, was leading 15,000 soldiers from northern Italy to the Spanish Netherlands, where he was to take over as the region’s new governor. The Spanish troops marched along the so-called Spanish Road that led through the Alps. The Cardinal-Infante’s orders from his brother, King Philip IV of Spain, allowed him the leeway to assist his cousin before proceeding to the Netherlands. Aware that Horn and Bernhard were operating independently, the archduke and his field commander, Count Matthias Gallas, saw a golden opportunity to devour their opponents piecemeal. In early May, the Imperialists broke camp in Pilsen and marched south to Regensburg. A Protestant garrison numbering around 3,800 held Regensburg. Bernhard was camped nearby with about 10,000 troops, but his corps was outnumbered more than 2-to-1 by the advancing Catholics, who grew stronger with the addition of Bavarian reinforcements. Gallas besieged Regensburg on May 23, while Bernhard stood by helplessly. Bernhard had no choice but to propose a union with Horn. This forced the Swedish marshal to cut short his siege of Überlingen on Lake Constance and march to Bernhard’s assistance. While the siege of Regensburg dragged on through June into July, Horn and Bernhard linked up on July 12 in Augsburg, astride the Baden-Bavarian border. Hoping to divert the Imperialists, they crossed into Bavaria and overran the garrison at Landshut on July 22. The Protestant onslaught was so fierce that the Catholic commander, Johan Aldringer, was trampled by his own troops while trying to rally them. Despite the Swedish victory at Landshut, Regensburg fell to the Catholics four days later. The Protestant army got some much-needed breathing room when the Imperialists unexpectedly countermarched east to block a two-pronged Protestant threat against Bohemia by Baner and Saxon general Hans von Arnim. Protestant forces, led by German noble Bernhard Saxe-Weimar and Swedish marshal Gustav Horn, bogged down on the flat land south of the Heselberg heights. Catholic forces counterattacked the Protestant right. Aware that the Cardinal-Infante had reached the Tyrol, Horn and Bernhard again split up, with Horn moving south to check the Spanish prince’s advance while Bernhard rested his force in the meadows along the Danube and awaited the Imperialists’ return. The Protestant commanders acted too soon—the Saxons quickly lost heart and the threat to Bohemia did not materialize. 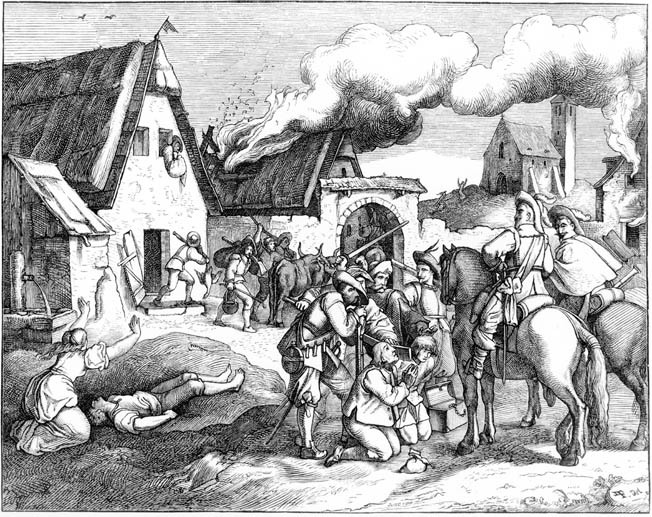 The Catholics countermarched and continued rolling back the Protestant position in southern Germany by laying siege to Donauworth, a key gateway city in Bavaria, on August 13. Falling back before the larger enemy force, Bernhard reunited with Horn again near the Free Imperial City of Ulm on August 16. That same day, the Catholics stormed and captured Donauworth. While the Catholics seemed invigorated by their successes, the Swedish forces and their German allies were suffering from disease and lack of supplies. The Catholic commanders had no intention of stopping their offensive at Donauworth; they made a 90-degree turn north and marched 17 miles to Nördlingen, which was occupied by 500 Swedish troops and 100 militia. Arriving before the city walls on August 17, the Catholic host encamped on a string of hills that lay south of the town. After a lengthy delay, part of which was spent trying to improve the morale of their forces, Baner and Horn arrived on August 23 with 16,000 troops and camped at Bopfingen, upstream from Nördlingen on the Eger River. The Catholic force before Nördlingen comprised 12,000 Imperialists and 6,000 Bavarians. Marching to a rendezvous with his cousin Ferdinand, the Cardinal-Infante was somewhere to the south with 15,000 crack Spanish troops. The Protestants were rapidly losing control of the situation. Bernhard and Horn agreed that they could not let a third strategic city fall to the Catholics in such a short span of time. Not only would it demoralize their troops, but the loss of yet another city might force some of their allies in southern Germany to switch sides. Nördlingen was only a half day’s march from Bopfingen, and the two Protestant marshals intended to await reinforcements from three separate groups led by Otto Ludwig, duke of Württemberg, and Count Johan Cratz von Scharffenstein. Among them they comprised 15,000 additional Protestant troops. A week after their arrival in Bopfingen, Bernhard suggested that the Protestants attempt to relieve the garrison from the north, where the Catholics had posted pickets but had not built entrenchments. On August 24, the Protestants advanced on Nördlingen from the north bank of the Eger, but there they encountered terrain unsuitable to large-scale maneuvers. As they approached the river opposite Nördlingen, they found thick marshes that were impractical for cavalry and hard going for foot soldiers. The brief foray, however, was not entirely without success, as Horn managed to ferry 250 musketeers across the river to the city, raising the garrison strength to 850 men. Four days later, the first sizable group of Protestant reinforcements arrived in Bopfingen. These consisted of 5,500 militia from Württemberg and another 1,000 professional soldiers rounded up from nearby garrisons. Cratz’s and Ludwig’s forces also were en route, but Ludwig had to march from Breach on the upper Rhine, which was a full week’s march away. Rabble of soldiers after Noerdlingen Thirty Year War by Josef Mathias von Trenkwald (1824-1897). While the Protestants awaited further reinforcements, the Catholics sprang into action. They had spent the first two weeks constructing siege works that bottled up Nördlingen from the south. By the first of September, they had enough guns in place and advanced close enough to the city’s walls to consider an assault. A furious bombardment began on September 3, badly shaking the already fragile morale of the garrison and townspeople. The following day, Gallas ordered part of the army to storm the city. The hasty assault was repelled at the cost of 500 casualties. The repulse was overshadowed by the arrival of the Cardinal-Infante later in the day with 12,000 Spanish foot soldiers and 3,000 horsemen. The Catholics now outnumbered the Protestants 33,000 to 22,500. Since the formation of the Heilbronn League more than a year before, Bernhard and Horn had been more rivals than partners. A council of war on the night of September 4 was contentious, as the two archrivals sought to impose their own views on the council. Although Cratz was within a day’s march with 3,400 troops, Horn characteristically advised waiting another week for Ludwig to arrive with as many as 6,000 additional troops. Bernhard, ever aggressive, believed that it was imperative for the Protestants to attack at once to relieve the beleaguered garrison. His confidence and determination swayed the council, which voted in his favor. Fearing that the Cardinal-Infante may have reinforced the Imperial-Bavarian army by the time of their attack, the Protestants planned to avoid a costly frontal assault against the enemy’s fortified position on the heights south of the city. Instead, they hoped to seize key positions from which to threaten the Catholic supply route to Donauworth and force the Catholics to withdraw, thereby lifting the siege. To accomplish this, the Protestant army would swing south through the Swabian Jura, a forested plateau that the locals referred to as the Arnsberg, and link up with Cratz’s reinforcements before marching into battle. The Protestants planned a circuitous route to mislead the Catholics into thinking they were withdrawing. 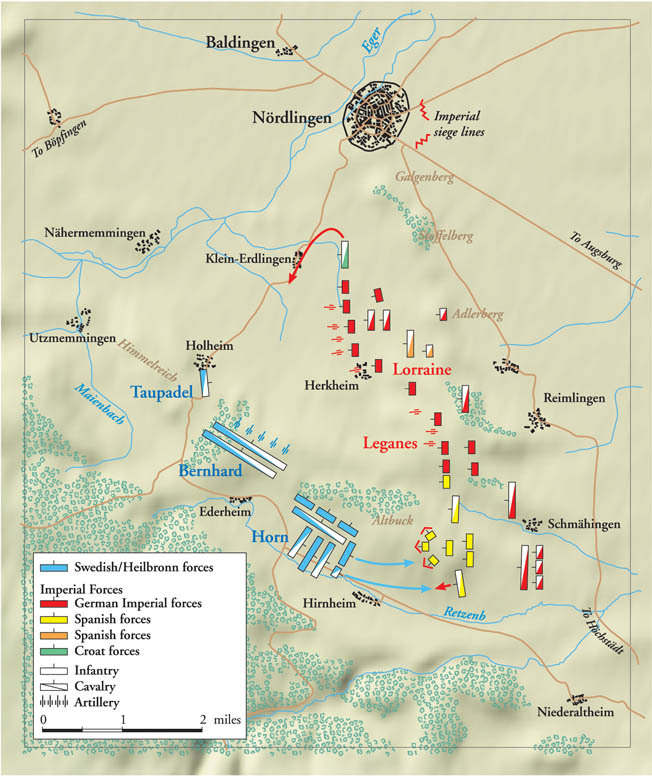 The plan called for the Swedish-German forces to march south to the village of Neresheim, where they would link up with Cratz and leave their supply wagons, then turn back north into the Arnsberg toward the Catholic position at Nördlingen. On the night of September 5, the Protestants broke camp and began their march. East of the Arnsberg the land dipped down into a defile before rising about 1,600 feet to a three-mile-long, V-shaped chain of nine distinct hills, with Nördlingen situated at the top right of the formation. Inside the chain of hills the land dipped downward to a flat plain known as the Herkheimerfeld. Nestled in a vale between two hills were the hamlet of Ederheim and the Rezen, a small stream that served as an obstacle to advancing troops. Two miles east ran the road from Nördlingen to Donauworth. The Protestants’ knowledge of the area’s geography was sketchy at best. A strong screen of Croatian scouts backed by Catholic dragoons stationed in the Arnsberg made it impossible for the Protestants to properly reconnoiter the ground over which they would advance. Indeed, they envisioned the terrain directly south of Nördlingen as one large hill. Once they deployed, it quickly became obvious that Allbuch hill was the key to the entire position. If they could roll up the left side of the V and succeed in dislodging the Catholics from the Allbuch, the Catholic position would become untenable. Bernhard commanded the Protestant left wing, and Horn commanded the right. The two commanders agreed that once the Protestants deployed, Horn would lead the attack with five infantry brigades, while Bernhard would protect the most exposed flank and rear of the army with three infantry brigades. In addition to the eight infantry brigades, the Protestants had 37 squadrons of cavalry, 1,000 dragoons, and 68 guns. On the morning of September 5, the Protestants broke camp and headed south, skirting the edge of the Arnsberg on the first leg of their march. Croatian scouts shadowed their movement and quickly sent word to Gallas that the Protestants were on the march. The Protestants continued south to Neresheim, where they linked up with Cratz. Born into a Catholic family, Cratz had fought under Count von Tilly in the first phase of the Thirty Years’ War, but when Elector Maximilian of Bavaria gave command of the Bavarian forces to another general, he promptly switched sides. His personal style in many ways mirrored that of Bernhard—vain and quarrelsome. Leaving their baggage under guard at Neresheim with a portion of the Württemberg militia, the Swedish-German army entered the Arnsberg with Bernhard leading the vanguard and Horn following with the main body and rear guard. They passed through two more villages before entering the thickest part of the forest. At about 3 pm, scattered musket fire rang through the woods as the Protestants ran headlong into a wall of Imperial and Spanish dragoons firing arquebuses. The resistance was sharp enough to force Bernhard to deploy some of his troops into the line of battle. The Protestants eventually forced the Catholic dragoons to quit the woods and take up new positions on the heights above Nördlingen. With the sun beginning to descend in the afternoon sky, Bernhard had to make as much headway as possible before nightfall in order to gain a secure foothold for the following day. Battle near Nordlingen 1634 Oil on canvas, 148 x 183cm. Stockholm, National Museum. Gallas had anticipated a Protestant advance along the south bank of the Eger and had deployed large numbers of infantry on the hill closest to the town. The Imperial infantry held the Catholic right, while the Spanish troops had filed into position on the Catholic left. In the late morning, the Catholics broke ranks, thinking that the Protestants were marching away from Nördlingen. By mid-afternoon they once again stood to their arms in preparation for a full-scale battle. Bernhard spent the second half of the afternoon driving the enemy dragoons steadily back. By 6 pm, the fight had spread. 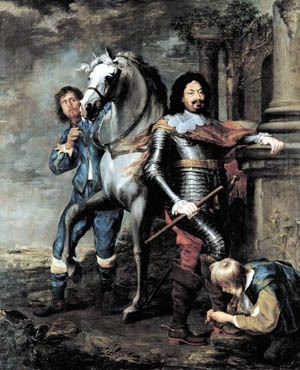 To check Bernhard’s advance, Spanish commander Diego Felipe de Avila de Guzman, the marquis of Leganes, rushed 500 crack musketeers to the wooded Heselberg hill. By this time Bernhard was anxious for Horn to join the fight and relieve pressure on his weary soldiers. Having established the position of his corps on three of the nine hills overlooking Nördlingen, Bernhard broke off the fight to rest his troops. The Swedish troops under Horn were having great difficulty hauling their artillery along the narrow path through the Arnsberg. The Swedish foot had finally exited the Arnsberg at 10 pm, but Horn’s cavalry did not reach the field of battle until midnight. Nevertheless, a portion of the Protestant infantry resumed the fight where Bernhard had left off. Despite the near total darkness that had enveloped the battlefield, they pressed on, and after two hours of fighting drove the small Catholic force from the heights. When the Protestants exited the Arnsberg, Gallas correctly deduced that they would try to turn the Catholic position with an assault on the Allbuch and Schonfeld hills. To counter the threat, he sent orders to the principal Spanish officers to begin immediately constructing fortifications on both hills. Throughout the night, the Spanish and Imperialists toiled to create the best fortifications possible on short notice. By dawn, the Spanish had completed three redoubts atop the Allbuch. The southernmost redoubt was occupied by one regiment, the center redoubt by two regiments, and the northernmost by a regiment and a battalion. The Catholics further strengthened the redoubts with 14 guns. Count Giovanni Maria Serbelloni, the Spanish artillery commander, oversaw the Allbuch entrenchment and commanded the forces on that key position. Should Serbelloni need assistance, he could draw on three more Spanish regiments stationed to his immediate rear. Altogether the Spanish deployed nearly 7,500 foot, more than half of their infantry, on or near the Allbuch. Guarding this force’s flanks were 3,000 Spanish cavalry under Gerardo di Gambacorta. Leganes had stationed four infantry regiments atop the hill. Duke Charles of Lorraine commanded the bulk of the 5,000 Imperial and 3,000 Bavarian foot soldiers stationed on the Catholic right flank atop the remaining high ground. Supporting the right flank were nearly 10,000 cavalry. Gambacorta and Imperial General Ottavio Piccolomini led nearly 7,000 cuirassiers stationed in two echelons between the Schonfeld and the Allbuch, while Johan von Werth commanded 3,000 Bavarian cuirassiers covering the right flank. The Catholic line bristled with some 50 guns. An artillery duel began between the two opponents shortly after sunrise. Horn’s troops filed into position on the flat ground south of the Heselberg. His force consisted of five infantry brigades and 19 cavalry squadrons. The deployment of the Protestant forces was constricted by the narrow space between the hills. Because of this, Horn had no alternative but to deploy his troops in four echelons of alternating infantry and cavalry. The infantry brigades had a half-dozen field guns and averaged 1,750 to 2,000 men each, for a total of about 9,400 men. Saxon General Johan Vitzhum von Eckstadt would lead the first wave of the attack, while Horn would direct the subsequent waves. Horn’s cuirassier regiment was the first to come to grips with the enemy. They rode to the south side of the Allbuch, where they found themselves forced to cross a ravine to reach the hill. Slowing down as a result, they received withering fire from the Toralto Regiment, one of the so-called Old Tercios in the Cardinal-Infante’s army that were renowned for their fighting prowess. The armor-plated horsemen charged uphill toward the redoubt manned by the Toralto men. The attack fizzled out almost immediately when the horsemen were taken in flank and rear by two regiments of Burgundian heavy cavalry guarding the extreme left of the Catholic line. They would have been cut to pieces had it not been for the timely assistance of two Protestant heavy cavalry regiments. All three Protestant regiments promptly retired, just as their infantry was ascending the hill. The infantry, which numbered nearly 3,400 men, drove straight uphill toward the redoubt manned by 1,500 Spanish soldiers. During the bloody melee, both Catholic colonels were cut down by Protestant musket fire. The defenders abandoned the redoubt and fell back toward the rear of the hill. While the Protestants milled about the captured fortification, a powder wagon exploded in their midst, causing substantial casualties and disorienting many survivors of the blast. At that moment, the 1,800-strong Idiaquez Regiment, another of the storied Old Tercios, surged forward and overran the Protestants, dislodging them from their newly captured position. As the Protestants fell back they were harried by Catholic cuirassiers, who rode among them slashing and stabbing. The struggle lasted about an hour before the Catholics regained control. Horn ordered forward a second wave of attackers, totaling some 3,200 muskets and pikes. As the Protestants ascended the hill, Horn rode forward to rally the soldiers who had survived the initial attack. The second wave had even less luck than the first, and in a short period they were descending the hill, having taken a sound beating from the entrenched Catholic defenders. The scene was repeated at least seven more times as Horn, who seemed oblivious to casualties, tried to take the hill by sheer force of will. In an effort to keep the Catholics from reinforcing their left wing with troops from their right, Bernhard ordered his first echelon of cuirassiers down from the Heselberg onto the Herkheimerfeld. The eight squadrons, numbering about 1,120 men, wore protective helmets and breastplates and were armed with wheel-lock pistols and sharp sabers. Bavarian and Imperial counterparts rode forth to engage them. The cavalry clash swirled over the plain, with the Protestants taking significant casualties before the overwhelming Catholic firepower drove them back toward their own lines. From the Heselberg, Bernhard watched the repulse with great concern. He ordered Cratz to ride into battle with the second echelon of cuirassiers. Seeing yet another wave of Protestant cavalry enter the fray, Gallas ordered the Imperial army’s cavalry reserve to shift northward in case the Protestants gained the upper hand. Bernhard’s cuirassiers repeatedly charged the Catholics, only to be repulsed by the growing numbers of enemy cavalry. At 8 am, three hours after the Protestant assault on the Allbuch had begun, Johan von Thurn’s brigades marched into battle. Instead of reporting to Horn as instructed, Thurn led his two brigades, comprising five regiments, directly to the Allbuch, where he launched a full-scale assault on the northernmost redoubt. Despite outnumbering the defenders, Thurn’s force suffered severe casualties and was unable to pry the Catholics from their barricades. Rather than pull back, Thurn ordered his men to hold their ground on the exposed slope of the Allbuch. The tide of battle began to shift rapidly in the Catholics’ favor, and they struck hard at Thurn’s vulnerable position. Thurn’s men began to fall dead or wounded in droves as the Catholic musket fire took its toll. Out from the vale between the Schonfeld and Allbuch, Imperial and Spanish cuirassiers rode forth and charged Thurn’s foot from the rear, further opening gaps in their ranks. Realizing that the enemy now controlled the field, the Protestant cavalry retired to the safety of the rear. Thurn ordered his men to cut their way out. Less than half of his 3,350 men made it back to the Heselberg. After five hours of fierce fighting, Horn broke off his assault on the seemingly impregnable Allbuch at 10 am and rode off to confer with Bernhard about a general retreat. Just as Horn arrived, Bernhard ordered his last few cavalry squadrons down onto the Herkheimerfeld to help the other Protestant units disengage from a seemingly unwinnable cavalry action. Bernhard suggested to Horn that they entrench and await reinforcements from Ludwig. Horn insisted that the Protestant army must quit the field before it was destroyed. Bernhard eventually consented and agreed to fight a holding action while Horn attempted to withdraw into the Arnsberg. Once Horn’s wing reached the safety of the forest, Bernhard would gradually disengage. On the Herkheimerfeld, the Catholic cavalry was forcing the Protestants back at every turn. Cratz tried to rally the flagging Protestant horsemen, to no avail. All along the Catholic line, soldiers and generals watched with awe as their horsemen pursued their adversaries with a vengeance. Several echelons of cavalry swept onto the Heselberg, dislodging and dispersing Bernhard’s infantry brigade. The rout occurred so quickly that Bernhard had no time to rally his men. Unsaddled and wounded twice, Bernhard would have been captured had not a fellow soldier offered him his own horse to escape. Horn planned to withdraw his forces along the narrow valley between the Heselberg and the Resen until he reached a ford that would take him through Ederheim. From there he intended to continue until he reached the road into the Arnsberg. By placing his artillery near the front of the column, Horn hoped to prevent its loss should the Spanish attack his rear. It turned out to be a grave mistake. No sooner had the vanguard started marching than the Catholics struck Bernhard atop the Heselberg. Meanwhile, as Horn’s vanguard neared Ederheim, a large group of Bavarian cuirassiers charged down the south slope of the Heselberg into the retreating column. Slashing with their swords, they threw the column into confusion and cut it in two. The gap grew larger as Croatian scouts swarmed into the fray, harrying Horn’s already demoralized troops. Some infantry managed to make it across the Rezen into Ederheim, but the artillery and the main body were cut off several hundred yards from the ford. Rather than protecting their comrades, the Protestant cavalry scattered in every direction. Many of Horn’s foot soldiers threw down their weapons and begged for quarter. Large numbers were shot or stabbed on the spot. Three full Protestant brigades were destroyed in the massacre, and Horn was captured. The destruction of the Protestant army continued throughout the day and well into the night. The job of chasing down the remnants of the Protestant army was largely given to the Bavarian cavalry and Croatian scouts. The Croatians located the Protestant baggage train at Neresheim, where they slaughtered the guards and plundered the contents. It was a decisive Catholic victory. Protestant losses far eclipsed those of the Catholics. The Protestants lost 8,000 killed and wounded and another 4,000 captured, while the Catholics lost 3,500 killed and wounded. The Catholics captured 450 Protestant flags and 68 guns—as well as Horn and Cratz. With no army left to raise the siege of Nördlingen, the garrison promptly surrendered and was spared the sword. The victory enabled Gallas and Ferdinand to capture many key cities in the Upper and Lower Palatinates and Württemberg. Without the Swedes to support it, the Heilbronn League ceased to exist, and the Catholics gained control of southern Germany. Within the year, Ferdinand II negotiated a treaty with the German Protestants that ended the fighting in war-torn Germany. The Peace of Prague in May 1635 brought the armies of the rebellious princes back into the fold of the Holy Roman Empire. Nördlingen and the Peace of Prague marked a key turning point in the Thirty Years’ War. After 17 years of religious warfare, the German Lutherans and Ferdinand’s Catholics were reconciled with each other. But the war was not over yet. The rulers of Sweden, France, and the United Provinces were not about to allow Ferdinand to maintain unchallenged control over Germany. The same month that peace was proclaimed, France declared war on Spain and fighting flared anew in the Rhineland. Germany would not know peace for another 13 years. Tags Alps, Archduke Ferdinand, arqebus, Augsburg, Battle of Nördlingen, bernhard saxe-weimar, Breitenfeld, Catholic Church, Catholic League, Count Tilly, Defenestration of Prague, Elbe River, Ferdinand II, gustav horn, Gustavus Adolphus, Heilbronn, Holy Roman Empire, King Philip IV, Militia, Palatine Frederick V, Peace of Prague, Regensburg, Saxon, Saxons, Spain, Sweden, Thirty Years' War, United Provinces, Weimar.